15th century, Tibet, Mahasiddha, bronze, private collection, photo by Christie’s. This mahasiddha (or Tibetan teacher with a mahasiddha appearance) is seated on an antelope skin with his legs locked and holds a vajra sceptre in his right hand and a skull cup in the other. He wears the usual bone jewellery and spiral-shaped shell earrings. 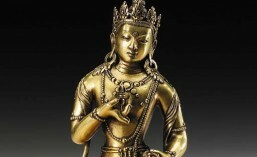 16th century, Tibet, mahasiddha, metal (copper alloy with cold gold and pigments), private collection, photo on HAR https://www.himalayanart.org/items/99218. Seated in a yogic posture, this adept with a wide gaze does the ‘turning the wheel of dharma’ gesture with his hands. The left hand does a pointing gesture, the right hand probably held a vajra sceptre. Like the famous Tibetan teacher Tsang Nyon Heruka, this mahasiddha (or Tibetan yogi with a mahasiddha appearance) has his hair gathered in a prominent bun. 15th-16th century (or 16th-17th century? ), Tibet, mahasiddha, gilt copper alloy, private collection, photo by Uppsala Auktions https://www.uppsalaauktion.se/en/auctions/?auction_name=20160614&catalog_nr=1244. Seated on a human hide, the above holds a skull cup in his left hand and probably had a vajra sceptre in the other. A vase of longevity is placed on a lotus attached to the base. This gesture of salute is associated with Dampa Sangye but the sculpture has not been identified as such. He appears to be holding lotus buds in his left hand and there is a skull cup before him. This entry was posted in (Maha)siddhas, Historical people, Tibet, Unidentified and tagged 15th century, 16th century, 17th century, bronze, buddhist, gilt copper alloy, Himalayan, Mahasiddha, sculpture, statue, Tibet, Tibetan. Bookmark the permalink.